During the 1860’s Josiah Turner and James Starley formed the Coventry Sewing Machine Company and recruited skilled engineers from the London area to join them, one of these engineers was a man named William Hillman. In 1869 the company changed its name to Coventry Machinists Company Ltd and like many other manufacturers in the area embarked on producing velocipedes. In 1870 William Hillman and James Starley patented a new bicycle called the “Ariel” and by 1885 William Hillman was a partner of the bicycle manufacturer Hillman Herbert and Cooper producing a bicycle called the Kangaroo. Hillman's new company soon established itself, and before the turn of the twentieth century, Hillman was a millionaire. With wealth came the means to fulfil Hillman's next ambition: to become a car producer. Hillman had moved into Abingdon House in Stoke Aldermoor near Coventry and decided that a sensible plan would be to set-up a car factory in its grounds. A history of the Rootes family. Standing among the bicycles in his workshop, Mr William Rootes, father of two boys named William and Reginald, decided that the time had come for him to start selling the noisy machines which were frightening the horses in the Kentish lanes around his home. "There's a future in motor cars," he said. The time was the turn of the century and Mr Rootes was a better prophet than he knew. Motor cars were to become one of Britain's greatest industries and his two sons were destined to emerge as industrial leaders and as builders of their own motor empire. William Rootes, the father of William Edward, later Lord Rootes, was not a wealthy man, but a small-time business man who ran a bicycle shop at Hawkhurst in Kent. Believing that both his sons, William and Reginald, should start their career with a good education, he insisted that they were sent to Cranbrook School. By the time they were ready to leave school at 16, he had prospered, adding a motor agency to his bicycle shop, but neither son decided to join the family business, each preferring to go his own way. William Edward started his career as a penny an hour pupil at Singer Motors Ltd.; little knowing that he would eventually own this company. During the 1914-18 War he served as a lieutenant in the R.N.V.R. and in 1917 he was given a special demobilisation in order to pioneer a new development for that time - the establishment of a plant at Maidstone to enable aeroplane engines to be repaired instead of being scrapped. The war ended before this was fully operative. He then contacted his brother Reginald, who by this time had a promising career as a civil servant at the Admiralty, and talked him into joining him in partnership in order to re-establish the car sales firm of Rootes Ltd. In 1919 Reginald decided to join his brother at Maidstone, where they started to build an empire. Reginald was a great administrator while William Edward was the salesman, showing an uncanny ability for assessing future trends in public taste. By 1926 they had acquired offices and showrooms in the heart of London's West End, at Devonshire House. Within a matter of months they had acquired other branches in various parts of the country and become the largest motor distributing company in Europe. As they prospered, many well known and old established firms in the motor industry began to feel the impact of economic recession. But while some companies closed down, the brothers accepted the challenge. In 1928, the Rootes brothers were the largest distributors in England. The brothers saw the opportunity to go into volume manufacturing production. For these companies this was a new era. Instead of separate plants with resources insufficient to meet the demands of extending and changing markets, they were now part of a strong centralised organisation into which each dovetailed smoothly. By cutting costs and centralising control in a manner ahead of their time, William and Reginald Rootes had formed a group which was a powerful, almost self-contained giant. The Rootes Group was formed by the acquisition of Humber Ltd, Hillman Car Co and the Commer Commercial Vehicles Company. These three companies were failing fast, due to outdated plant and production methods, and gave the brothers a chance to put their ideas into reality. The task facing the brothers was that of turning failure into success - and they accepted the challenge. In 1931 the Hillman Wizard was launched as a new car for world markets. Although it met with only limited success they were not deterred, and it did give them time to unfold their ideas and to straighten out the firms they had acquired. By 1932 the Rootes Group was taking shape and they launched another car, the Hillman Minx, which turned out to be an immediate success. Their ideas had paid off, and the companies had been saved. 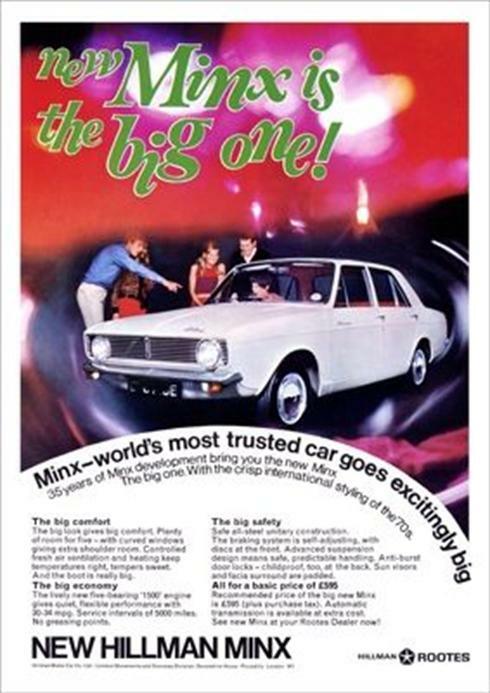 Little did they know that the Minx name was to be used time and time again over the next four decades and has now become a classic name in motoring history. Many people have said that when the Rootes Group acquired these companies the cars they produced were not, and should not be called Hillman, Humber, Talbot or Sunbeam. But these companies had been building dated cars on dated machines and were in urgent need of rationalisation and, indeed, some form of integration. Apart from this, the brothers made sure that the identities of the marques were not submerged and this policy was continued until the Chrysler take-over in 1967. The luxurious Humber’s, the sporting Sunbeams and the quality Hillmans all retained their distinctive personality. With the outbreak of the Second World War, the Rootes factories were turned over to the manufacture of military vehicles, William and Reginald put their services at the disposal of the Government. William was appointed Chairman of the Shadow Industry Plan and he headed the Supply Council of the Ministry of Supply, he played a prominent part in the application of quantity production methods to aero-engine and aircraft construction, not in 1939, but three years earlier. Rootes was the first company to enter the Government's Shadow Factory Scheme for the volume manufacture of aeroplanes and aero engines. By the time the sirens were sounding, Rootes factories were turning out aircraft as well as vehicles for the R.A.F. and other services. But perhaps the work which caused William Rootes the greatest satisfaction during the war was the part he played after the terrible night of November 14/15, 1940, when the Germans dropped 35,000 incendiary bombs, 50 land mines and 1,400 high explosive bombs on the city of Coventry. The task of leading a reconstruction committee to set Coventry on its feet again was given to William Rootes. In 1942, as a result of the raising of Coventry and other prodigious war work, William became Sir William Rootes, Knight Commander of the British Empire. Peacetime assessments in 1945 revealed that the Rootes Group had made one out of every seven bombers produced in the United Kingdom during the war, 60 per cent of the armoured cars and 30 percent of the scout cars. It had also built 50,000 aeroplane engines, had repaired 28,000 others wrecked in crashes or in battle, had repaired more than 12,000 vehicles for the Army and the Royal Air Force and had assembled 20,000 other vehicles imported from allied countries. At the beginning of the war, 17,000 employees were on the Rootes pay-roll. By the end, one in every hundred people in Great Britain employed as civilians in the war effort was working for, or on behalf of, the Group. The early post-war years saw not only the establishment of new factories abroad but also the setting up of new Rootes trading organisations in key overseas markets. Among these was Rootes Motors Incorporated, an independent concessionaire company with headquarters in New York and with a distributing organisation covering all major American states to meet the increasing demand in the United States for British cars. In addition, Rootes Motors (Canada) Ltd., another concessionaire company, with headquarters in Toronto, was set up in the same year, 1947. Before 1948 the Group had its own company trading in Belgium and another concessionaire company was established in Rio de Janeiro, Brazil. Other companies, in other countries, followed. The Rootes Group was maintaining factories with more than seven million square feet of floor space, it had 15 concessionaire companies and many assembly plants overseas. It exported to more than 160 countries - compared with a pre-war total of 69. In 1950, as Chairman of the Society of Motor Manufacturers and Traders, William Rootes played the major role in organising the first ever British Motor Show in the USA. Held in New York that show netted over three million dollars' worth of exports. Trade with the USA began to escalate and in the six years from 1951 to 1956 it netted no less than 169 million dollars' worth. In 1959 William Rootes was created a Baron and became Lord Rootes of Ramsbury. Despite its size and the scope of its activity, the Rootes Group was unique among British motor manufacturers in that it remained a family concern. Lord Rootes' son, the Hon. Geoffrey Rootes, was Deputy Chairman and Managing Director of the Rootes manufacturing companies, and the Hon. Brian Rootes, the second son of Lord Rootes, became Managing Director of Rootes Ltd., the Group's merchandising company. Mr Timothy Rootes, the son of Sir Reginald, was Director in Charge of Sales and Service of the manufacturing companies, covering more than 1,000 dealers in the U.K. The second generation followed closely in the footsteps of the first and was prepared to carry on the family tradition of high quality manufacture and forceful trading. In 1959 a minority group of Rootes Group workers had begun to strike at regular intervals, much to the annoyance of the majority. The workers concerned were from a Rootes subsidiary company, British Light Steel Pressings Ltd. of Warple Way, Acton, London. The shop stewards at the Acton factory first learned how to shout strike when a couple of newly weds at the factory, who were night shift workers, asked to be transferred to day shift. This was done and 1,500 workers came out on strike! At a time when strikes were relatively rare, this one became known as the 'Honeymoon Strike'. The Rootes family had begun to regret ever taking over the firm but at the time it had become necessary to increase their pressing division, to keep up with the demand for their vehicles. Strikes at the Acton factory continued and on 1st September 1961, 1, 000 workers walked out again, bringing the total stoppages since 1st January 1961 to 82. These were crippling the Rootes Group and there was nothing they could do about it. The strikes, which were mainly unofficial and against union advice, had caused the loss of over 27,000 man hours at the Acton factory, which in turn had caused the loss of 17,000 man hours at other factories. This latest strike was called because of 'fears of extensive short time working and large scale redundancy'. When management refused to hold talks with the men's leaders (not the unions), they walked out. On Monday, 4th September 1961, the strikers decided to send delegates to the TUC Annual Conference at Portsmouth, to try to persuade the TUC to adopt a new national policy in relation to the car industry. They wanted 52 weeks pay per year for all workers in the car industry, no matter what the situation. They also told the TUC that they did not want any interference by union officials. "We feel this has been allowed to develop as a local problem because of lack of action from outside and we think we are in a better position to get a settlement with our management" a spokesman told Acton Gazette reporters. He continued, "We don't want the type of assistance the union officials gave us last time, when we stopped work over a short time dispute. On the first day we stopped, we were ordered back to work without anybody considering why we had come out." The strike delegates achieved nothing at the conference. By 18th September 1961, the strike had brought the Rootes Group almost to a standstill with over 6,000 workers from the various Coventry factories being laid off. Only the non-production line staff continued to work. Until now, Lord Rootes had refused to comment on the strike, but on the 26th September 1961, he made his first statement to the workers concerned: "Return to work by Thursday 28th September or be sacked." The strikers ignored the threat, and on Thursday, 28th September 1961, all 1000 workers were sacked. A recruitment drive was started to replace striking workers. The strikers objected to this, protesting that the Acton Labour Exchange was engaged in strike-breaking by sending men down to the factory for jobs - jobs which, as the committee said: "They will go back too, once the management accepts to abide by the rules of the committee." Rootes replied: "We regard the strikers as ex-employees. We have invited applications for their jobs. Some strikers have re-applied and we believe others will follow." The Rootes Group had complete backing from all their other employees, from the unions, and from the wives of the strikers (this was given a great deal of publicity). But the sacked strikers would not listen, stating that "We are determined to see it through." As the weeks rolled on, 8,000 workers from other factories were made redundant. Rootes were now having financial problems, and it was in fact the beginning of the downfall of the Rootes Empire. Controlled by five men, the strike had caused irreparable damage to the Rootes Group and its finances. There was a call for a public enquiry after it was disclosed that the strike was Communist planned and directed. By 2nd November 1961, Rootes had found other manufacturers to supply them with the body panels that should have been produced at the Acton works. They had also re-engaged 1,750 workers at their Coventry factories in an attempt to get the production lines rolling once more. The strikers from what was now labelled "the dead duck strike" were gradually drifting back, and by 30th November, Acton's work force was up to 680, 430 of whom had been strikers. By December 21st 1961, only 120 men were still out. After a final meeting, they decided to go back, but Rootes turned them away, giving them £40 compensation as a token gesture. Only one of the strike committee members was re-employed. The dispute may have been over, but it was only the start of the Rootes Group's problems. Their first priority was to build up their workforce to enable them to fulfil the outstanding orders. In November 1962, Rootes announced the total cost of the Acton strike up until the year ending 31st July. They showed a loss of £891,088, compared with a profit of nearly £3 million the previous year. This type of loss Rootes could not afford. They were already heavily committed to a new project, the Hillman Imp, and the opening of a new plant at Linwood in Scotland where it was to be produced. This turned out to be the biggest phase of expansion in the group's history, and losses at this time were the last thing Rootes wanted. On 30th September 1964, Lord Rootes announced that during October three representatives of the Chrysler Corporation would be joining the board of Rootes Motors Ltd. - Irving Minett, Group Vice-president, International Operations of the Chrysler Corporation, Lovis B. Warren, a director of Chrysler, and Robert C. Mitchell, President and Managing Director of Chrysler International. The move followed the acceptance by the shareholders of Rootes Motors Ltd. of the Chrysler Corporation's offer to acquire 30 per cent of the ordinary voting shares in the company and 50 per cent of the non-voting 'A' shares. The first official news of the link came on 4th June when an agreement was reached in New York by Lord Rootes and Sir Reginald Rootes with Lynn A. Townsend, President of Chrysler, and George Love, Chairman of the Chrysler Board, concerning the proposed acquisition of the shares. Treasury consent to the proposals was given on 29th July by the Chancellor of the Exchequer, who at that time was Reginald Maudling. In the formal letter to shareholders outlining the offer, issued on 10th August by S.G. Warburg Co. Ltd. on behalf of Chrysler, Lord Rootes stated that the Rootes board welcomed the Chrysler approach: in view of the intense and increasing competition in the motor industry at home and overseas, it was a logical and desirable step in the future development of the Rootes Group to become associated with a strong international organisation such as Chrysler. On 29th September, Warburgs announced that they had received the necessary acceptances from the shareholders, and this was followed by Lord Rootes' statement regarding Chrysler representation on the board of Rootes Motors Ltd. Although it has never been confirmed officially, it has always been suspected that this had all come about because of the Acton strike and Rootes' inability to recoup the losses involved. These may not have sounded that onerous at the time, but it must be remembered that the cost of building vehicles was not much less than the price they were being sold for (to make them competitive) and that breaking even on any project was a long, slow process. Lord Rootes kept his workers informed as to what was actually taking place between Rootes and Chrysler, and when negotiations finalised the following message was passed to all his employees were expressing his views on the situation: "You will all have read about our partnership negotiations with the Chrysler Corporation which have resulted in this American motor manufacturer, the third largest in the United States and indeed in the world, acquiring an interest in Rootes Motors Ltd.
"I would therefore like to take this opportunity to declare that I and all the other members of the Rootes Board are confident that this association with Chrysler will prove to be the prelude to a period of great progress for the Rootes Group. "It does not mean that the Rootes family interests, financial or otherwise, in Rootes Motors will be diminished in any way but rather that a real partnership is being established with Chrysler with a view to bringing advantages to all parties concerned. "Among these advantages will be an increase in the scope and activities of the Rootes Group as far as both cars and commercial vehicles are concerned - and this in turn will offer wider opportunities to all our employees. "You will all be asking exactly how we shall gain from this partnership with an American company. First of all we shall obviously benefit from our contact with the Chrysler Organisation in America with its immense facilities and "know how" as far as engineering, research, production and other aspects of our industry are concerned. "In this country, this will help to make us more competitive and more progressive and I anticipate that this will mean that the Rootes Group will be able to expand more rapidly. "Abroad, the association is also going to stimulate our vitally important export sales as we shall be able to benefit from Chrysler's wide facilities in merchandising and manufacturing throughout the world. There is no doubt that the present highly competitive climate in world markets calls for larger motor manufacturing groups. "You will also be wondering exactly how this partnership will operate. We have, in fact, agreed with Chrysler that the existing management of the Rootes Group will continue while at the same time three Chrysler representatives will be appointed to our main board. In this way, we shall be able to co-ordinate policy and expansion both in the UK and world markets and work together to one another's advantage. "As to the future, the Chrysler Corporation with their broad-minded approach to world trading, have already pledged, in a letter to the treasury, that they will not initiate any action to impair either the home or overseas operations or the management and direction under the Rootes Board of our company - or our relations with the government, labour, our British shareholders and the public. "Finally I would like to say that as a frequent visitor to the United States over many years, I am very well acquainted with the Chrysler Organisation and its products. I have long held them in high regard and I am confident that we are all going to make a good team, and that we shall create a happy and progressive partnership. I am also confident that everyone in our Group will contribute towards our efforts to take full advantage of the opportunities which this association is offering us - and that, perhaps not immediately but in time, it will bring great benefits to all of us." One can't help wondering just how much Lord Rootes really wanted this crucial development. It's hard to imagine that a man who had dedicated his life to building up an empire from nothing and against all odds, using methods that a great many people and manufacturers disapproved of at the time, but followed suit once they were proved successful, would want to give up such a large percentage of his business without feeling at least a little remorse. On 12th December 1964, it was announced that Lord Rootes of Ramsey, Chairman of the Rootes Group, had died. Many tributes were paid to this great industrial leader from people in all walks of life, including representatives from all his major competitors. Sir Reginald Rootes was elected Chairman in succession, and Geoffrey Rootes, now the second Lord Rootes, elder son of the late Lord Rootes, became Deputy Chairman. Many people have said that it was the late Lord Rootes who dictated company policy and, indeed, who held the Group together. However, it soon became obvious that not everyone was in agreement as to the way the company had been run, and on 19th January 1965 it was announced that massive organisation changes were to be made. Although a great number of employees did not like what was happening to the company. During the financial year of 1966/7, the Rootes Group had accumulated enormous losses totalling £10 million. It became obvious to all that Chrysler would soon take over control of the Group. This actually took place in January 1967, when they increased their holding of voting shares to 77.3 per cent. It was now only a matter of time before the Rootes Group as such disappeared completely. In March 1967, Sir Reginald Rootes stepped down from office and Geoffrey (the second Lord Rootes) took his place as Chairman. Chrysler's Gilbert Hunt was then appointed Managing Director and given the job of reclaiming what was left of the once thriving Rootes Empire.